The Aviary has capacity to cater for upwards of 150 people with an expanding awning and marquee enclosure. The Aviary seats 20 people on the upper deck comfortably, or remove the stools and have standing for 40 guests. Downstairs is the functional bar and multipurpose area that is tailored to the clients needs. The Aviary’s body structure is alloy sheeting, held in place with advolock rivets to a galvanized frame. Powered by the reliable Gardner 6LXB engine, the very same motor used for many off shore trawlers. Independent front suspension and a drop-centre rear axle to maximise internal space. The Titan was built for superior comfort, with the largest windows and headroom in its class. 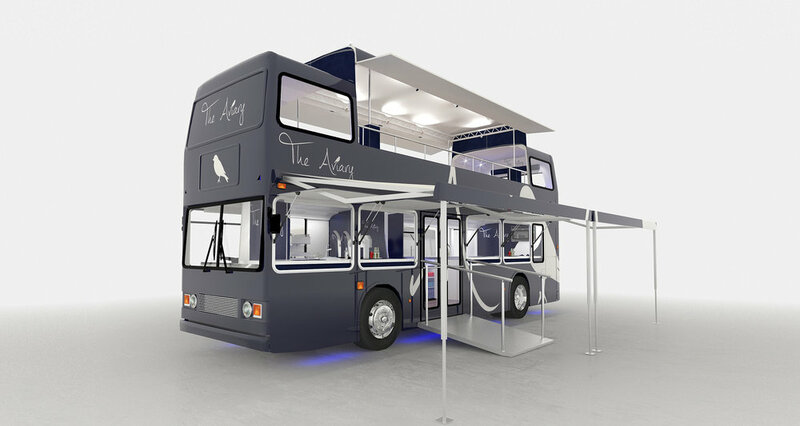 The Aviary rides on air suspension and has the stopping power of hydraulic brakes. The Titan was selected for The Aviary makeover due to its advanced, category-leading design. State of the art surround sound system, with multi zone patch work connections for tailored set ups. Energy efficient LED’s that brighten the night, letting you choose the colour and mood of The Aviary.